You don't have to make the bottom crust chocolate if you don't wish to, but you know me... I've gotta add chocolate whenever and wherever I can! 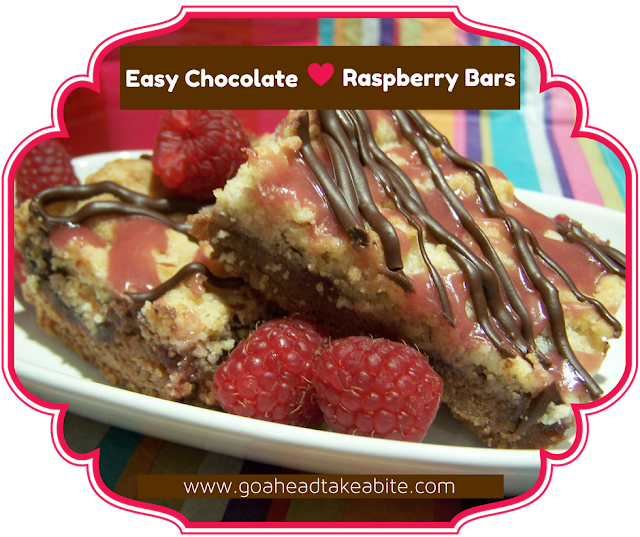 LOL If you want the classic raspberry bar, just omit the cocoa powder, replace it with 1/4 cup AP flour and skip the drizzles! Dump the crumbled dough into your prepared pan and press it out to the corners and edges as evenly as possible. Spread the Raspberry Jam onto the dough and set aside. Using a second mixing bowl (or rinsing and drying the bowl you just used) start the next layer. Add the second pouch of cookie mix and the 1/4 C of AP flour and whisk them together. Add in the other stick of softened butter and the second lightly beaten egg and again, using a cutter or fork, mix until you have large crumbles of soft dough. This time you want to drop the crumbles onto the jam layer as you would a cobbler or coffee cake topping. Once it's completely cooled, lift it out of the pan with the ends of the parchment paper and place it on a large cutting board or clean counter top. 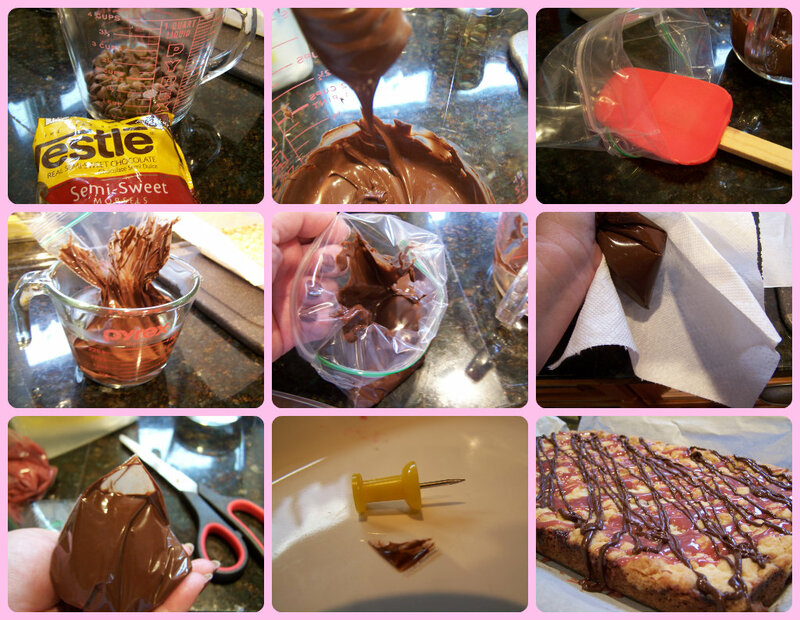 Drizzle with the raspberry glaze and melted chocolate and allow it to set up for about 30 minutes in a cool dry place before cutting it up into bars. 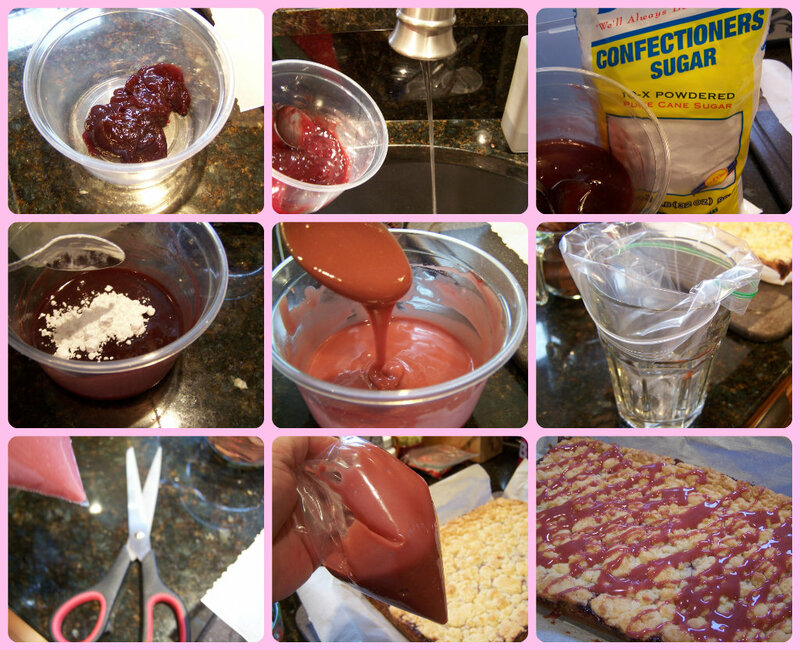 Thin jam with warm tap water, add confectioner's sugar one heaping spoonful at a time until you've reached pourable thickness. Place in zip-top bag and snip a tiny bit off one corner. Drizzle liberally over bars. Melt chocolate morsels in microwave 15 to 20 seconds at a time until it reaches a pourable consistency. Place in zip-top bag, snip off a tiny bit of one corner and drizzle liberally over bars. Thanks, Rob! Slowly easing back into it. :~/ Been thinking of you too! Hope all is well. Hi Sue! Well, if they turn out to be "Bud approved", I'll know they must be OK. LOL Let me know if you do make them, OK? Thanks, Kathleen! Good to be back! Oh wow- they look awesome! And by the way- inquiring minds want to know...where ya been?? You're back!!! I'd just been thinking that it was time to check up on you, so I started here to see if I'd missed anything in the midst of being woefully far behind myself. And here you are - yay!!! Can't wait to make this! !